One day, Josko Gravner was also impressed by glassware made by Massimo Lunardon in the restaurant, and he immediately visited Massimo's atelier. 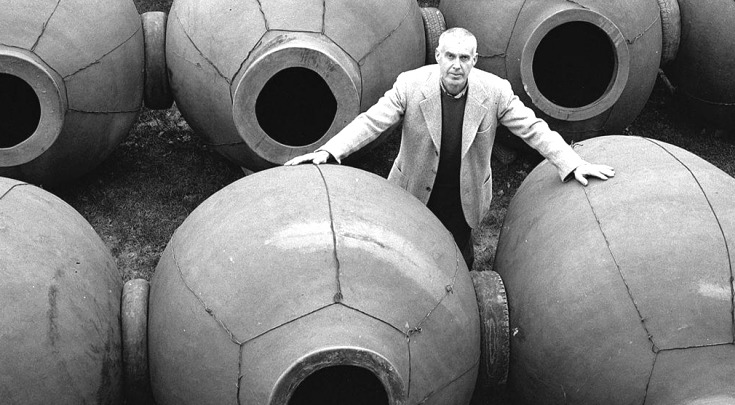 Massimo Lunardon perfectly understood what Josko Gravner wanted, and then they reached a consensus to make special wine glass right away. This glass is provided to official agent of Gravner only. Aroma and Taste as it is. Wine floats on the palm. In the Gravner Glass, your wine relaxes in a large and round shape designed by beautiful curved line and shows everything it has without any bias, exaggeration or deformation. Originally this glass was specially crafted for Gravner wines, but it can be used for any of white, red and rosé, even for Champagne and saké as well. There is no stem, therefore wine and hand are very close, its feeling is like drinking wine by palm. Besides, there is no risk of breakage of stem (This is one of the weak part of normal wine glass), and easy to carry, so it is ideal glass for outdoor or BYO as well. Glass artist Massimo Lunardon produces this glass piece by piece by hand-blown. It's a piece of modern art but also for practical use. Every piece has slightly different size and shape.